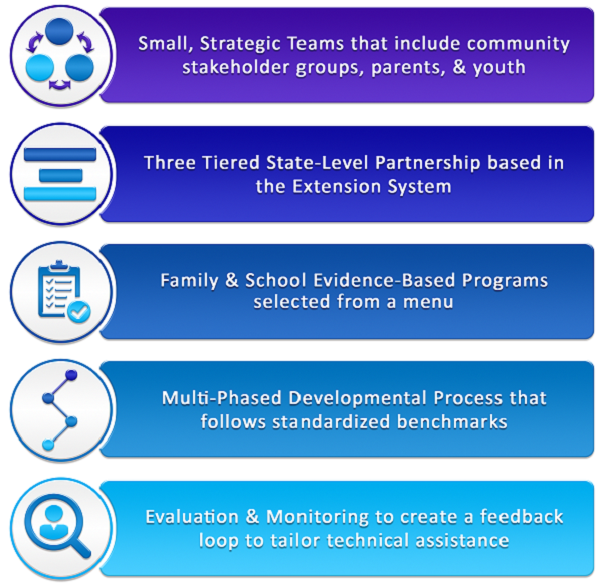 Each of the Core Components is based on implementation science principles and when used together, they create the formula for sustained, high quality implementation of the best prevention programs available for youth and families. The PROSPER Benchmarks were designed to guide Community Teams through their formation to long-term sustainability to ensure they are integrating each of these components every step of the way. The PROSPER approach also uses a proactive technical assistance strategy, which means that trainers and coaches have prepared manuals and online resources to address the issues that are most likely to arise at each developmental phase. They also hold regular learning opportunities to present new ideas and tools and allow time for sharing what has worked well for those involved in a PROSPER effort. Click here to learn more about the trainings.